So we recently caved and bought another cookbook. We’ve really been very good recently, but the cover of this one had been making us drool during our last few bookstore visits and we finally just had to. The book is Plenty by Yotam Ottolenghi of the London restaurant Ottolenghi, apparently a collection of recipes from his vegetarian column in the Guardian. 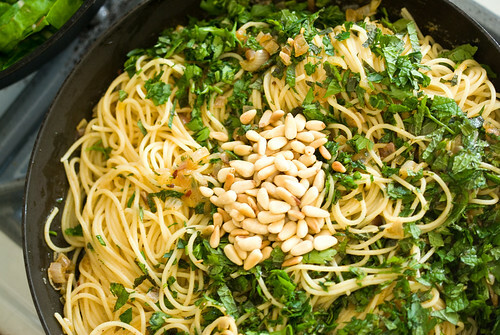 One of the first things we tried out of it was a dish of noodles dressed with vast quantities of Moroccan spiced butter, fresh herbs, and pine nuts. I didn’t make the noodles from scratch with saffron mixed into the dough, although I’m sure that would have been lovely, but it just wasn’t happening. 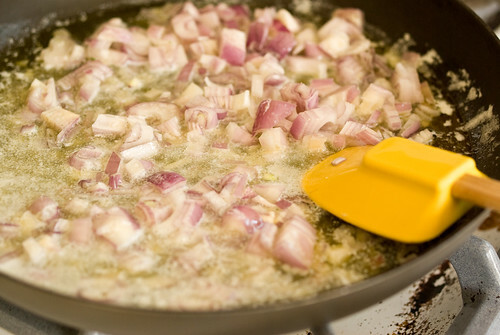 Once the shallots were soft I added the mix of paprika, cinnamon, coriander, ginger, turmeric and red pepper flakes. 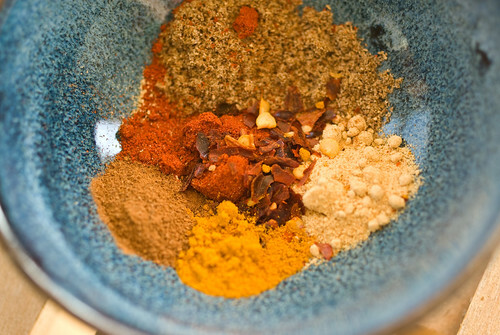 After smelling the mixture Jon pointed out I could have just used the Moroccan seven-spice we have in our spice drawer, which smells exactly the same. 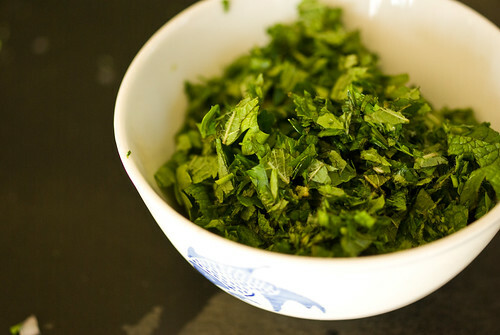 Then I mixed in a big pile of fresh mint and parsley. Our mint plant is producing particularly vast and fragrant leaves right now; when I was chopping these up Jon smelled them from two rooms away. Then all that remained was to toast a handful of pine nuts and toss them in. 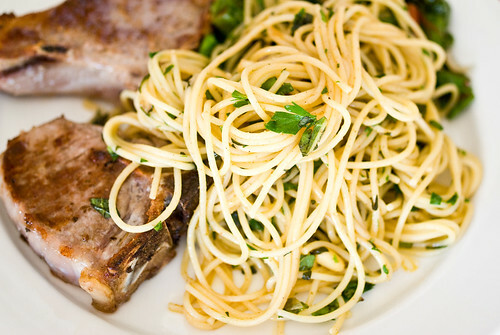 We ate the noodles alongside small lamb chops and a pile of sauteed Swiss chard, and it was good. Buttery as all get out, but good. It was too rich for us to eat the whole batch, but I saved the leftovers and mixed albacore tuna into them for lunch the next day, which balanced it out nicely. Digging out my copy of Plenty now as I can’t remember this recipe! I want these noodles! I forgot the saffron and cayenne when I made this – next time I think I’ll remember, all that butter wants some serious spice. The fresh herbs are awesome, though. this looks absolutely outstanding. i MUST try this! your posts are so beautiful. Thank you! If you make anything that I’ve written about, please come back and tell us about it! Love this book! I’ll have to try the noodles next!